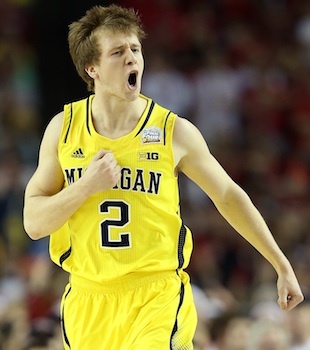 How did Spike Albrecht get his nickname? Long before he commanded the nation's attention with an unreal performance in the first half of the NCAA title game, Spike Albrecht was just a boy who loved baseball. And it was that love for baseball that earned Michigan's freshman guard his unique nickname while growing up. As the story goes, Michael Joseph Albrecht received his first pair of baseball spikes when he was just 5 years old and he liked them so much that he refused to take them off — even if he wasn't on the diamond. He even wore them on the court while playing basketball, his father told USA Today earlier this week. "I just started wearing them everywhere," Spike Albrecht told MGoBlue.com this week. "I was wearing them out to church and out to eat and people started calling me 'Spike.' I think my grandpa started it and it just kind of stuck. Here I am, 20 years old and people are still calling me Spike." What's really funny is that Spike isn't the only one with a notable nickname when the family gets together for Thanksgiving. USA Today reports that his brother Charles goes by "Chachi" while his other brother Stephen goes by "T-Baby." Albrecht garnered plenty attention with 17 points during the first half of Monday night's NCAA title game against Louisville, but the unusual nickname has been one of his main bio points all season. In fact, Michigan fans are probably rolling their eyes right now since they likely heard this little factoid any time Albrecht gave Trey Burke a rest during the regular season. Still, even the most ardent Wolverines supporters have to admit it still makes for a great angle. Who else would expect that an undersized guard's nickname is Spike and not, say, Ollie? • Why is the NCAA basketball court elevated?